Senior Jasmine DePalmo blasts past the competition with one of the best individual seasons in Saints Track history! 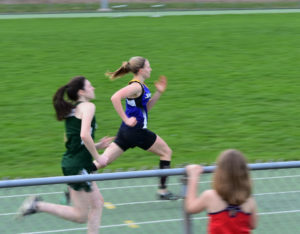 The Saints Varsity Track team enjoyed an excellent season this spring. Despite a small roster size, there were many outstanding accomplishments. For the girls, the most noteworthy team accomplishment was a 4th place finish in the 13 team League Championship meet. Individually, the team was led by newcomer Sydni Kelly (11th grade), who was a dominant performer all season in the shot put and discus throw. Also, senior Jasmine DePalmo had one of the best individual seasons in Saints track history. She had league championships in the 100 meter dash and long jump; a sectional championship in the 200m and top 6 finishes at the state qualifier in the 100m and long jump. She is ranked as the #2 sprinter in school history (100m and 200m) and is the school record holder in the long jump at 16 ‘ 9½”. The boys team accomplished an undefeated dual meet season making them the league champions! This is an incredible achievement for a team of just 10 members. A very close 2nd place finish at the Sectional Championships capped the team schedule. The boys won 8 events at Sectionals, led by multiple event winners John Manchester (10th grade), Hans Matzal (11th grade), and Eli Krupka (11th grade). John and Hans added their names to the list of school record holders, Hans in the 400 meter dash (breaking 30-year old record) and John in the high jump. John won the high jump at the State Qualifier and will be representing the school and Section III at the State Meet on June 9. FHS Production of Fiddler on the Roof Nominated at the Syracuse High School Theater Awards!